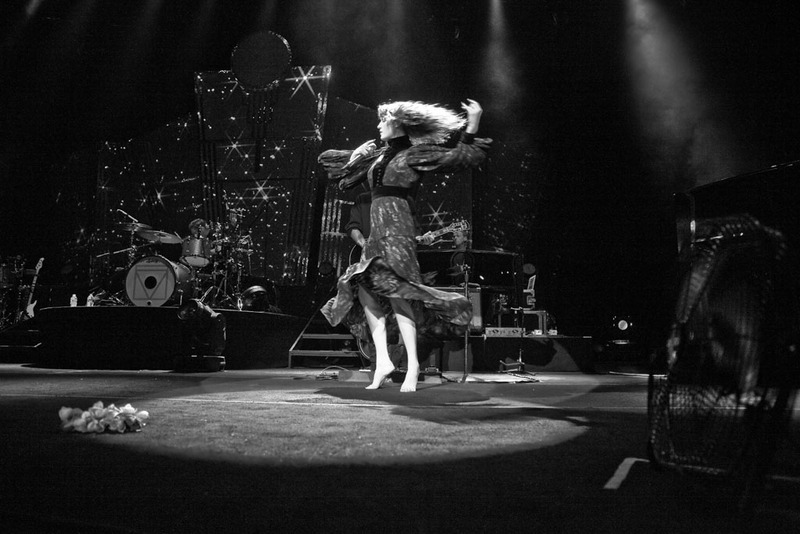 Florence Welch opened her show in Mansfield, MA in proper fashion by performing “Only if For a Night” off her latest LP Ceremonials. The crowd responded with shouts and cheers as soon as they saw the English superstarlet’s silhouette appear on stage. Florence fans (complete with facepaint whiskers, glitter and high expectations), were treated to the vocal showcase during “Howl” from Florence’s debut studio album. Welch performs at a high energy level, maintaining a ballerina’s posture while moving at a near-sprint from stage right and stage left. Her music begs to be heard live because of the sheer power of her vocals. Add on her backup vocalist’s harp, piano and drums and the whole experience is bordering on surreal. Continue below for the setlist and an extensive gallery from photographer Stephen Atkinson.